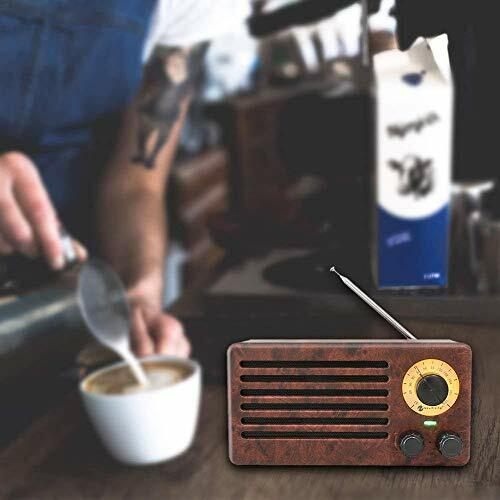 Shantan Wood Grain Speaker Bluetooth Wireless Radio fm am Home Outdoor Retro subwoofer Speakers Audio Super bas Louder Hands-Free mic 1800mah Fashion Portable Mini by Shantan at Style Cares. Hurry! Limited time offer. Offer valid only while supplies last. Functions: bluetooth playing, TF card playing, USB playing, FM radio, hands-free calling, audio AUX input. Retro radio style, clear frequency dial, convenient knob FM, high-sensitivity stereo digital FM radio chip, high-sensitivity, low noise, super anti-interference ability. 【Features】Retro radio style, clear frequency dial, convenient knob FM, high-sensitivity stereo digital FM radio chip, high-sensitivity, low noise, super anti-interference ability. 【Functions】bluetooth playing, TF card playing, USB playing, FM radio, hands-free calling, audio AUX input.